Can a pet food company help the industry move away from industrialized agriculture? Halo is committed to making it happen. We talked with the team—including the CEO and a natural rancher—to find out how the brand’s value trio of being “Holistic. Whole. Humane.® ” creates better food for your beloved pet while caring for the planet at the same time. The brand got its start in 1986 when a woman’s cat, Spot, got sick. Vet-prescribed food didn’t work, so Spot’s owner asked a chef and nutritionist friend to help create food using real ingredients from the kitchen. Once Spot recovered, people began asking for “Spot’s Stew,” and Halo was born. In 2012, CEO Myron Lyskanycz came on board to further the goal of creating a different kind of pet food—one that was ethically and sustainably sourced, and used whole food ingredients. To fulfill the mission of changing the way companion animals are fed and farm animals are raised...for the better, Myron partnered with natural bison rancher Dave Carter, who was pasture-raising his animals and supporting regenerative and sustainable farm practices. Halo knows people treat their pets like family members and want the best for them, but feeding dogs and cats the best food isn’t always as simple as it sounds. “Pet parents don’t always know what to look for, and when they do look, the pet food industry doesn’t make it easy for them to understand what they see,” Myron shared. “It goes beyond simply reading labels. Consumers need to understand the role of specific ingredients and how they contribute to—or detract from—their pet’s wellbeing. That’s one reason why moving animals out of confinement and away from antibiotics and growth hormones is so important. These standards are one step towards making inroads in an industry that’s notorious for putting profits above animal welfare and environmental responsibility. Myron (the CEO) and Dave (Director of Sourcing and Ingredient Stewardship) are part of the essential team that helps Halo do its work. We had lots of questions about ingredients, agriculture, and some of the obstacles they’ve overcome to make inroads in the pet food industry. Read on for our Q&A! In the early days, what were the biggest obstacles to overcome in terms of moving away from industrialized agriculture? Dave Carter (DC): The biggest obstacle was getting consumers to recognize just how interconnected we, our food, and the agricultural system really are … including people, pets and our planet. In the 1990’s, a small but growing number of ranchers and farmers began steering away from industrialized production toward a more sustainable model that focused on delivering healthy meat, healthy animals, healthy vegetables, and healthy ecosystems (a philosophy Halo calls “OrigiNative®”). 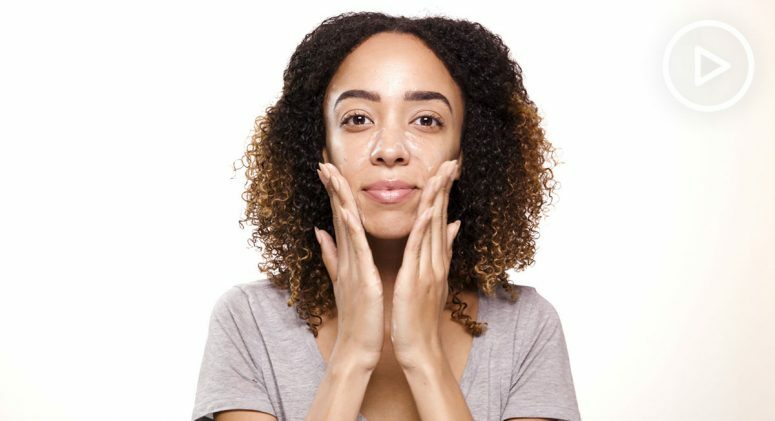 But their long-term financial survival depended on finding companies and brands that would purchase and use all of these natural whole ingredients sourced outside of the factory-farm culture. Finding a brand like Halo, that insists on using whole meats, non-GMO ingredients, sustainable wild-caught ocean seafood—and one that is third-party certified to be ethically sourced, was a genuine blessing. This emerging partnership of sustainably-minded producers, human food companies, and select pet food manufacturers finally gave pet parents and conscious consumers a chance to truly change how pets are fed, farm animals are raised, and how our ecosystems can be protected. Myron Lyskanycz (ML): One of the exciting aspects of our work is that we’re not convincing consumers to do anything unusual, we’re simply meeting a desire that already exists. Almost 70 percent of households have a companion animal, and over 50 percent of today’s younger pet parents say they aren’t completely satisfied with their current pet food brand. Owners are asking for pet food and treats made with whole meat (not rendered, powdered, high-ash content “meat meal,” which isn’t allowed for human consumption), are certified humane, use only wild-caught fish from sustainably managed fisheries, and contain only non-GMO vegetables. They’re looking for pet food with ingredients that they understand and would use in their own kitchens, like Spot’s mom did. The real challenge is creating awareness that a food like Halo is out there and available. We’re competing against large pet food conglomerates that claim their “first ingredient is meat,” so as a smaller manufacturer, one of the hardest things is getting our voice heard, which is why we work with partners like Thrive Market to help provide true nutrition education and food options. Was OrigiNative® sourcing a practice from the beginning? How has the program evolved and improved over the years? DC: OrigiNative® was a term developed to describe our commitment to sourcing ingredients and insisting on agricultural practices that represent an “as it should be” philosophy using ingredients derived using “original” animal husbandry and farming practices (not tinkered with or genetically modified), and proteins from animals reared in their native environments. It’s a recognition that Mother Nature did a great job perfecting proteins and food crops over the millennia, and that oftentimes the best we can do is to simply step back and honor that natural evolution. How do you go about vetting ranchers and farm partners to work with? DC: I’ve been involved in agriculture for more than four decades, and have seen significant transitions in agriculture during that time. Coming out of the 1980s “Farm Crisis,” a handful of pioneering farmers and ranchers broke free from the rapidly industrializing models, blazing a trail for organic practices, natural meat production, and regenerative agriculture. I became acquainted with those pioneers through my work in farm organizing at the time, so they were my “go-to” producers when it came time for Halo’s OrigiNative® sourcing. I communicate and work with these producers on an ongoing basis. What’s one of the most rewarding parts about not only creating high-quality pet food, but supporting better agriculture practices as well? ML: Our commitment to the Halo mission has multiple facets, focusing on the humane treatment of our life-giving farm animals, giving back to shelter pets via our “#halofeeditforward” program, and also supporting better agricultural practices. The existing agricultural system is a larger emitter of greenhouse gases than the transportation industry, so as we witness the effects of climate change all around us, we believe promoting and facilitating a return to a more sustainable agricultural model can lead the charge to reversing the problem. Sourcing via free-range, pasture-raised, and sustainably caught methods gives us an opportunity to help return the earth to acting as a carbon sink versus a carbon pump. DC: Our personal health, the health of farm animals, and the health of our planet are deeply interwoven. Over the past few decades, a growing number of people have recognized that the choices we make in feeding our families (which includes our companion animals) help direct the way farm animals are raised, and the way that our ecosystem is maintained. What’s particularly rewarding for me is the growing recognition that ALL animals—whether they’re on the farm, in the ocean, or in our living rooms, can play an important—and positive—role in this process. Is there anything you wish people knew about conventional pet foods? 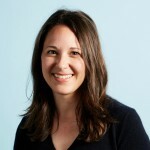 ML: Pet parents don’t always know what to look for, and when they do look, the pet food industry doesn’t make it easy for them to understand what they see. It goes beyond simply reading labels. Consumers need to understand the role of specific ingredients and how they contribute to—or detract from—their pet’s wellbeing. GAP (Global Animal Partnership): This 5-step animal welfare rating system focuses on three components: health and productivity, natural living, and emotional well-being. MSC (Marine Stewardship Council): When you see this blue label, you know the fish is wild, traceable, and sustainable. This designation is only given to fish or seafood from fisheries that adhere to the MSC Fisheries Standard, a science-based set of requirements for sustainable fishing. Non-GMO: All of Halo’s vegetables are grown without the use of pesticides or other chemicals. 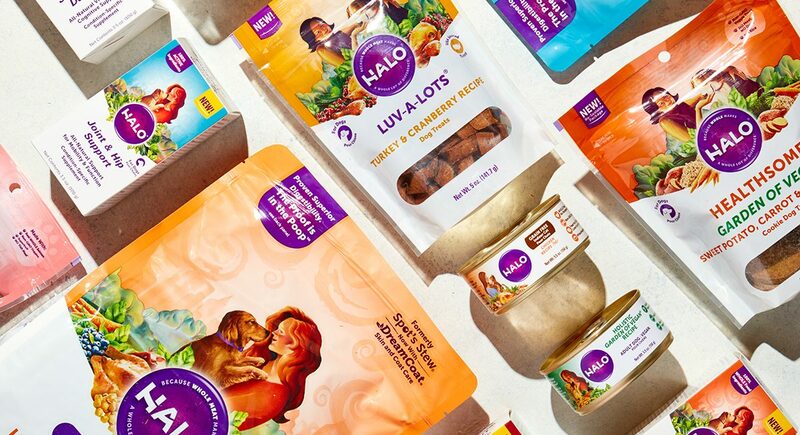 Every one of Halo’s foods, treats, and pet supplements undergo a verification process, which evolves with the brand. “We’ll always continue adding “industry first” humane and animal welfare certifications to our pet products,” Dave said. 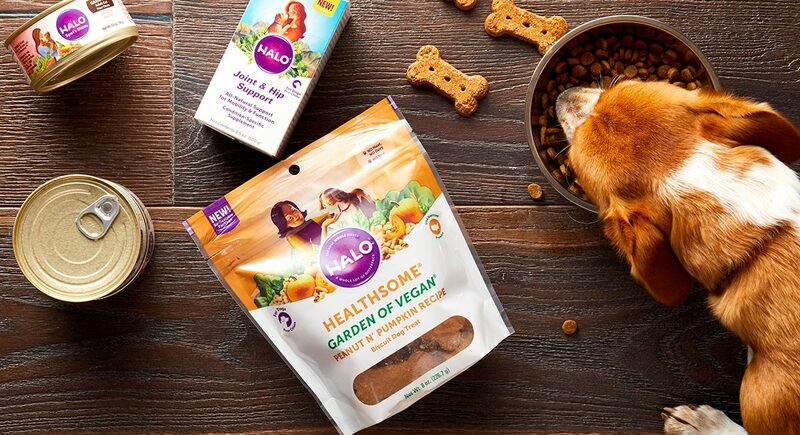 For pet-approved chow, Halo’s got everything you need to feed your furry friend the most wholesome diet possible. And don’t take our word for it—Thrive Market members have happy cats and dogs to prove it. Finicky cats are known to adore this fish blend using wild salmon, whitefish, and farm-fresh veggies. For felines who prefer wet food, this can takes the cake. Alongside chicken, you’ll find veggies like carrots, yellow squash, green beans, and celery that kitties will love in all stages of life. Both dogs and cats can enjoy these wholesome, freeze-dried treats that deliver a protein boost in-between meals.